The discussion after the Group of Eight and NATO meetings over the past week has been about Tony Blair’s comeback and its relation to Obama. Blair is spending a lot of time in the U.S. these days as a key advisor for Obama’s re-election. After engineering that re-election, he intends to return to Britain, and come back to power again as Prime Minister. Thereafter the Blair and Obama block will run the world (if it’s still there, which is unlikely), on behalf of the Blair Doctrine announced in Chicago in 1999: the era of The Treaty of Westphalia, meaning the era of the nation-state, is over. All hail to the global empire! A key plank of the Blair Doctrine for today is that NATO must be able to go to war without consulting national legislatures, because there is “no time” to get their permission.Just what Obama did in Libya, and what Defense Secretary Panetta, on behalf of Obama, told an incredulous Senate committee earlier this year: permission from NATO is all we need; we’ll consult you only when and if it’s convenient. An all-out assault on national sovereignty. Lyndon LaRouche characterized this as construction of an eastward-focussed military machine targetted at Russia. 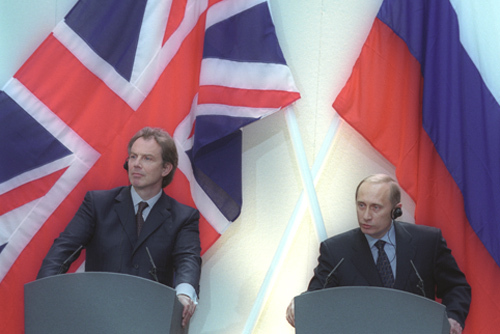 We are seeing the Putin Doctrine of national sovereignty and international legality, which is Westphalian, pitted directly against this Blair Doctrine. The issue of World War III, if it comes to that. On behalf of his masters, Blair is prepared to bring about the extinction of the human race if it doesn’t submit. Aligned with the Putin Doctrine are Russia, China, and India, now joined by Pakistan, which comprise between them the majority of humanity, on behalf of the nation-state and sovereignty. On the other side is the New Venetian Party controlling the British and Dutch monarchies, their lackey Tony Blair, and their mere tool Barack Obama. It makes clear how different the whole world will be from the instant Obama is removed from office. The fundamental issue is getting him out now. This entry was posted in Geopolitics, World News and tagged Blair Doctrine, Lyndon LaRouche, national sovereignty, NATO, Putin, Treaty of Westphalia, war by cnlib. Bookmark the permalink.